No, marble is not a good choice for a kitchen countertop. 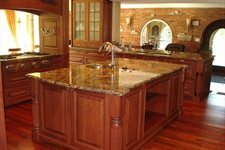 Although it can be sealed, it is not as dense as granite and therefore it is more porous and susceptible to being stained in a highly used area like a kitchen. It is much softer and it will chip and crack under frequent use.